This film needs little introduction. 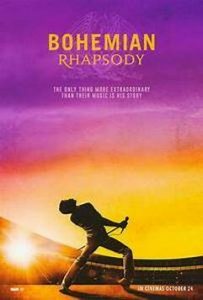 It is a foot-stomping celebration of Queen, their music and their extraordinary lead singer Freddie Mercury. It has wowed audiences, with Rami Malek’s portrayal of the lead singer winning plaudits from all, especially in the Live Aid performance at Wembley in 1985. With universal audience acclaim, the film has already won 2 Golden Globe awards and is nominated for 5 Oscars and 7 BAFTAs.